Call (865) 588-3937 today to schedule your Free Consultation in Knoxville, Maryville, Farragut, Fountain City or Sevierville! The first step to better vision after LASIK® is to schedule a Free Consultation with the experts at the Campbell Cunningham Laser Center. During this appointment, our caring and dedicated staff will take a reading of the prescription in your glasses or contacts. This quickly allows us to assess whether or not you are within the range of prescription that LASIK can treat. Next, we will perform a routine corneal topography map to determine the thickness of the cornea. Both tests will help us learn about the makeup of your individual eye and determine if LASIK is right for you. Next, our experts will explain the entire procedure from pre-operative exam through to the surgery and follow-up visits. You will have ample opportunity to ask any questions and learn all there is to know about this incredible procedure. We will offer a tour of our facility and our on-site laser center. Finally, if you are interested, our experts will introduce you to financing options. They can help you with the simple application and get you on your way to better vision! 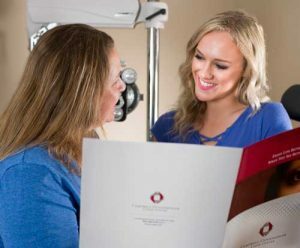 If you are interested in a Free LASIK Consultation at the Campbell Cunningham Laser Center in Knoxville or in our LASIK offices in Maryville, Farragut, Fountain City or Sevierville, call (865) 588-EYES or fill out our Consultation Request Form.